In 2013 Adobe introduced a tool called Generator, which allows you to generate image assets from your Photoshop file in real time. Pretty cool. Only tricky point, you need to rename all your layers to have Generator to export them correctly. This procedure usually takes quite a lot of time, and, as a result, your layer name become quite unreadable. So, yeah. Oven is gonna help you keep your mental sanity when you deal with assets. 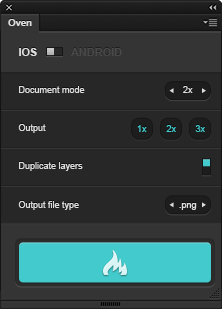 You can set Oven to output either .png or .jpg files. Turn “duplicate layers” on to keep your original layer labels.